Let’s start the week with a test of the Asus Zenbook Pro UX580GE, a 15-inch ultrabook thin profile and light but the components that have something to shake. It is particularly praised for its exclusive ScreenPad, for its immersive 4K screen and for its good connectivity. 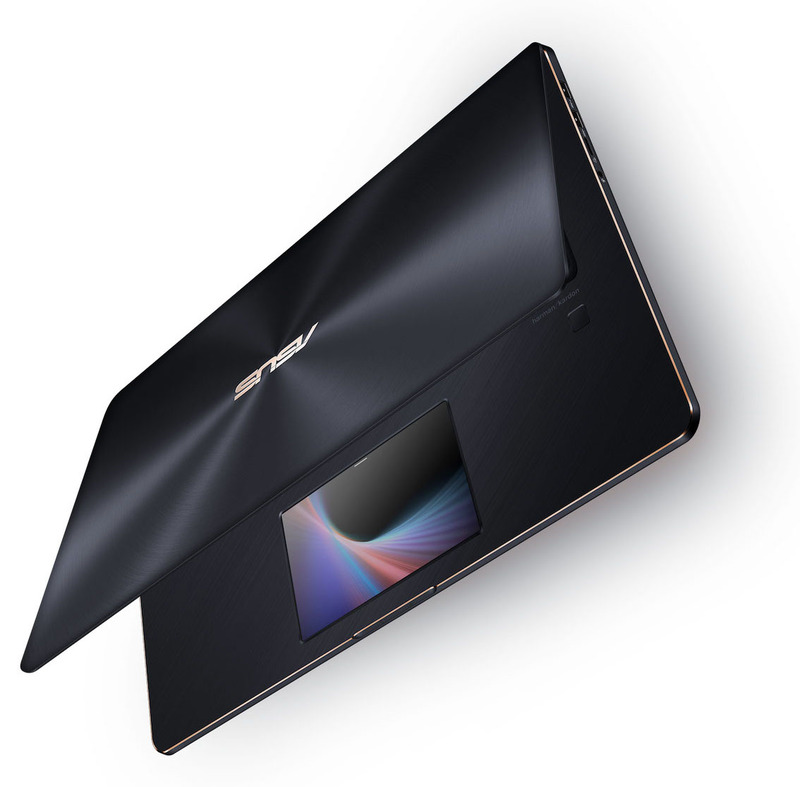 The 2018 version of the Asus Zenbook Pro takes many of the lines of Zenbook Pro 2017 (UX550). However, some differences are worth highlighting, starting with its appearance and the arrival of a new color Deep Blue Dive (very dark blue) with golden accents much appreciated by the tester. The interior inherits a nice brushed texture that hides stains better and should age better than the smooth UX550 finish. What’s more, the base seems more robust overall. Note that the inner frame is always made of plastic and that the PC surround is made of aluminum. No difference connectivity level. The tester just regrets one thing, the lack of full-size SD card reader. Otherwise, the interfaces are two USB 3.0, two USB Type-C supporting the Thunderbolt 3, an HDMI output, a headphone jack and a microSD player. Another regret, that the webcam is still in VGA (480p) definition, it is too little for 2018. With talk scalability, it is important to specify that the RAM is soldered on the motherboard, so there is no way to get more than 16 GB on this laptop. The SSD, on the other hand, can be exchanged if you opt for a lower model and plan to upgrade it yourself. Accessing the interior is quite easy, just unscrew the ten visible Torx screws on the sides. There are no hidden screws behind the rear rubber feet, as on other Zenbooks. Unconvinced by the pool in 2017 concerning the keyboard, the tester more willingly welcomes the Zenbook Pro UX580 thanks to a better rigidity of the base. Key distribution always requires a little adjustment time with its extra row of keys on the right and the integrated “Power” button among the rest of the keys. The feedback is a little too soft, but it does not pose a real problem in use. The keys are of course backlit and the inscriptions golden. The striking is quite quiet so typing in quiet places will not disturb those around you. For its part, the touchpad is a real novelty. This is a large Microsoft Precision clickpad with a pleasant touch-sensitive glass surface that perfectly captures multi-touch gestures. Physical clicks are a little soft, but they still work well. Its particularity lies in its built-in 5.5 inch LCD (ScreenPad) that can display various widgets and functions. For example, you can use it as a NumPad, as a way to control music, like a calculator or a Youtube player. It can also be used to quickly launch various applications on the computer, such as a browser or Word, and in some applications (Premiere, Photoshop, Office), it can double as a side screen with quick action shortcuts. The Asus Zenbook Pro UX580 is available with a full HD IPS matte display or a 15.6-inch (3840 x 2160 px) UHD 4K touch screen. It is from the latter that the model tested is equipped with an AU Optronics B156ZAN03.1 panel that Asus also uses on the Zenbook 15 inch Flip UX561. It is bright (307 cd / m2) with good 900: 1 contrast and reproduces wide-spectrum colors (100% sRGB and AdobeRGB) with good default calibration. What\’s more, it does not exploit the dynamic brightness (PWM) so no risk of ocular gene. The only point that has a little sadness the tester is the uniformity of the backlight is not optimal with a lower left corner about 20% lower than the upper right corner. The model tested is equipped with the strongest configuration of the UX580, a latest-generation Hexa Core i9-8950HK, 16GB of RAM, a 1TB NVMe PCIe SSD and a GTX 1050 Ti Pascal. The tester draws attention to the fact that the machine under test is a pre-production copy and that the performance can be a little disappointing compared to the references in the trade. Let\’s take a look at the processor that is currently the most powerful one that can be found in a mobile machine. Normally, it is intended to integrate larger PCs and placing it in a frame so fine has made some shake tester who feared massive throttling. This is not the case in reality. While the i9 can not maintain potentially high turbo speeds under demanding operation, it does not experience an untimely drop in frequency either (throttle symptom) and maintains standard clock speeds. The Turbo is therefore less well exploited than on thicker machines, but it was predictable. Limited to 45W, processor power is kept at a reasonable level to prevent temperatures from rising and gaining Hexa i9 compared to i7-8750H is not noticeable at this point. Note also that the overclocking character of the processor does not represent any gain here, due to thermal limitations. CPU aside, there is also the issue of GPU performance. Asus has been content with the full power version of the Nvidia GTX 1050 Ti for the Zenbook Pro UX580GE, and it\’s not surprising that it warms up and down during long gaming sessions but the tester I did not want to go into details here. The battery capacity is good for a thin and light ultrabook like the Asus Zenbook Pro UX580GE (71 Whr). The autonomy tests have not allowed to exceed 4 hours in Internet browsing with Wifi and ScreenPad assets.